The below video and the article which accompanies it are really for people who have just become interested in the lute and would like some help with the most basic questions concerning the different types of lute and their historical development. Many of the details of the story are uncertain and I welcome any factual corrections from the experts. The word “lute” really refers to a whole family of instruments which occupied a very important place in European music for most of the last thousand years. The European lute is descended from the Arabic lute, which was almost certainly introduced into Europe via the Moorish conquest of Spain in the ninth century. The word “lute” is probably derived from the Arabic “al’oud”. It is hard to know how quickly the European lute diverged from its Arabic ancestor, but paintings from the 14th century show distinctly different forms. At this stage the lute typically had four courses (pairs of strings, though the highest course was usually a single string). By the 15th century there were usually five courses, and six-course lutes first appeared during the second half of the century. 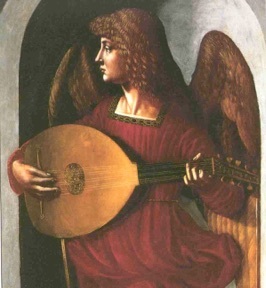 The last two decades of the 15th century also saw an important change in playing technique, with the use of a quill plectrum largely abandoned in favour of plucking with the finger tips. It then became possible to play two, three or more parts simultaneously on one lute, opening the way for the “intabulation” of vocal music which became such an important part of the lute repertoire for the following century. Paintings from c.1500 – c.1580 show a variety of sizes and shapes of lute, but almost always with six courses. The earliest surviving lutes with seven courses date from around 1580. As indicated by the printed books, seven courses are first required in 1532 (Hans Gerle), eight courses in 1599 (Terzi and Molinaro), nine courses in 1600 (Francisque) and ten courses in 1611 (Kapsberger). The exact dates are not important, but what we can say is that most lutes had only six courses for most of the 16th century, but this was rapidly increased to ten courses by about 1610. The extra strings were all added in the bass, and tuned to a scale, making it easier to play almost any bass note as an open string. In parallel with these developments in the solo lute, the late 16th century also saw the development of lutes for accompanying voices and other instruments. According to Piccinini (1623), the chitarrone was originally a bass lute tuned to a much higher pitch to increase its brilliance. The first course (and eventually the second as well) had to be tuned an octave lower than normal because the strings were not strong enough to be tuned to such a high pitch on such a large instrument. Further improvements in bass sound and extensions of the bass range required longer strings, and in 1595 an experimental lute was made with a long body and two bridges (this instrument survives in Vienna). However it was soon realised that the best solution was to make an extended neck so that all the strings could be attached to the same bridge, the treble strings running over a fingerboard in the usual way and the much longer basses being attached to a second pegbox at the end of the long neck. This instrument later came to be called the tiorba (English: theorbo; French: théorbe). A typical Roman theorbo of about 1610 has 14 courses, 6 courses of fingerboard strings perhaps 90cm long and 8 single bass strings up to nearly twice that length. However, many different sizes and styles of these lutes were made. Later in the 17th century the arciliuto (English: archlute) was developed for accompanying, the idea being to combine the virtues of normal lute tuning with the powerful basses of the theorbo. Most surviving archlutes are converted lutes with fingerboard strings of about 67cm and basses of up to 150cm. The solo lute in Italy also sprouted a neck extension and became known as the liuto attiorbato. These were typically small instruments (one popular size was around 58cm for the fingerboard strings and 85cm for the basses) for which really virtuosic music was written by Piccinini and others. Meanwhile in France the ten-course lute was the subject of much experimentation with tuning. Different tunings have very different resonances, even when the same notes are being played, and this led eventually to the abandonment of the standard lute tuning of fourths with a major third in the middle which had survived for more than a century. The new “standard” tuning which emerged is often called the “D minor” tuning, because it was usually associated with the note names f’, d’, a, f, d, A. The number of courses was increased to twelve, then reduced to eleven, so the classic “French lute” of the second half of the 17th century was tuned f’, d’, a, f, d, A, G, F, E, D, C. The basses were often retuned to suit the key of the music. This lute and its music was very influential in Germany, where some makers (from about 1720) added two extra bass courses on a pegbox extension (“bass rider”) to create a 13-course lute. In this type of lute, the lowest basses were only about 5-6cm longer than the other strings. Another type of 13-course lute used the extended neck principle, using eight fingerboard courses of about 72cm and five bass courses of about 99cm. Such instruments are often called “swan-neck” lutes. The lute declined in France very rapidly after 1700, while the 5-course guitar and the theorbo remained popular. Thus the history of the lute is largely Italian in the 16th century, French in the 17th century, and German in the 18th century. Anyone embarking on a study of the lute has three centuries of written music to explore, though to explore all of it one would need several different instruments!